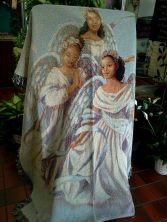 Angelic Trio is a beautiful Afghan with #3 African American Angels in a serene setting. A wonderful idea for a keepsake in memory of a loved one. Silk flowers can be added. 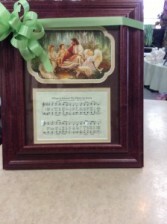 These MUSICAL picture frames have cherry Wood Trim and are wonderful keepsakes and feature Thomas Kinkade pictures with verse and a soothing melody. Great Sympathy Gifts. THIS LARGE CONCRETE GARDEN STONE IS A THOUGHTFUL KEEPSAKE FOR SYMPATHY THAT FAMILY AND LOVED ONES WILL CHERISH FOR YEARS. 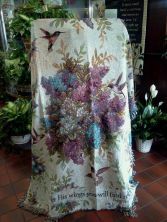 WE CAN ADD SILK FLOWERS TO THE BOW OR A SILK SWAG ON THE CORNER OF STONE FOR A ONE OF A KIND ITEM. Flowers convey a message that cannot be put into words. 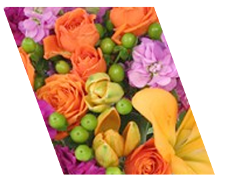 MOHLER'S FLOWERS BY UHL of Lima, OH provides a variety of fresh, fashionable floral designs to ensure that your gift is one of elegance and beauty. When you're looking for a unique hostess gift, token of appreciation or just a surprise to brighten someone's day, let MOHLER'S FLOWERS BY UHL customize and deliver one of our many fun, decorative & luxury gifts! We create dazzling presentations that are sure to please for any gift-giving occasion. To get your custom gift items, come by and see MOHLER'S FLOWERS BY UHL - your local Lima, OH florist.